It’s promising (threatening? ;-)) to be very hot today. Mylo and I went for our usual walk and I took my usual break on my usual tree stump in the meadow at the Narrenturm. We were having such a nice time outdoors I thought “I don’t want to go home” and decided on the spot to go to Café Weimar, dogwalking shorts and naked face notwithstanding. So Mylo and I traipsed off to Café Weimar where we sat under the awning and I had a croissant and caffè latte. As Maylo’s vet is very near there and I needed to pick up the food I had ordered for him I considered hanging around until they opened at 9:00 to save myself an extra trip. However it was only 8:15, and I thought that might be a bit too much hanging around. Then I found myself staring at the big sign announcing the weekly open-air market of organic and (relatively) local produce at the WUK on the other side of Währinger Straße. I’ve thought about checking that out for years and never gotten around to it. They didn’t open until 9:00 either, but I decided that those two things together were worth waiting for so I pulled out a little notebook from my bag and started making notes for work on Monday and my interview on Tuesday. I was able to pull my thoughts together really well (amazing what a cup of strong coffee and nice surroundings will do for one’s concentration) and then went off and bought grapes to take to M’s party tomorrow and picked up Mylo’s food. Just to top it all off—I texted P from Café Weimar and arranged to have dinner together this evening in Pötzleinsdorf. I have now closed up all windows and lowered all possible blinds to stem the onslaught of the heat and am sitting here with the fan blowing on my legs. Wishing you just such a nice day!!! For those of you who don’t know, Vienna has quite a number of vineyards within the city limits. There are historic reasons for this, dating back to the days of Maria Teresia, if I remember correctly. This means there is not only a good supply of local wine 😉 (and wine taverns–Heuriger–to sit out at in good weather) but also that there are very picturesque walks. 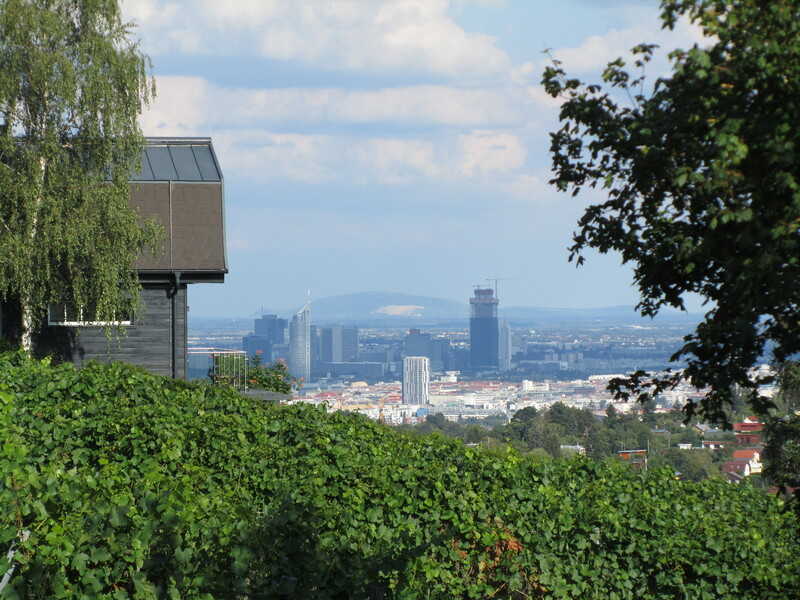 This photo of Vienna was taken from the vineyards in Neustift am Walde in the 19th district. I’m still not going to do a proper post on this “Magistratsabteilung” but I did want to give an example of their work. Someone chooses a mixture of flowers that is then planted in all the public places. This photo was taken at a traffic triangle near me. When they put these flowers in I was skeptical that they would amount to anything. 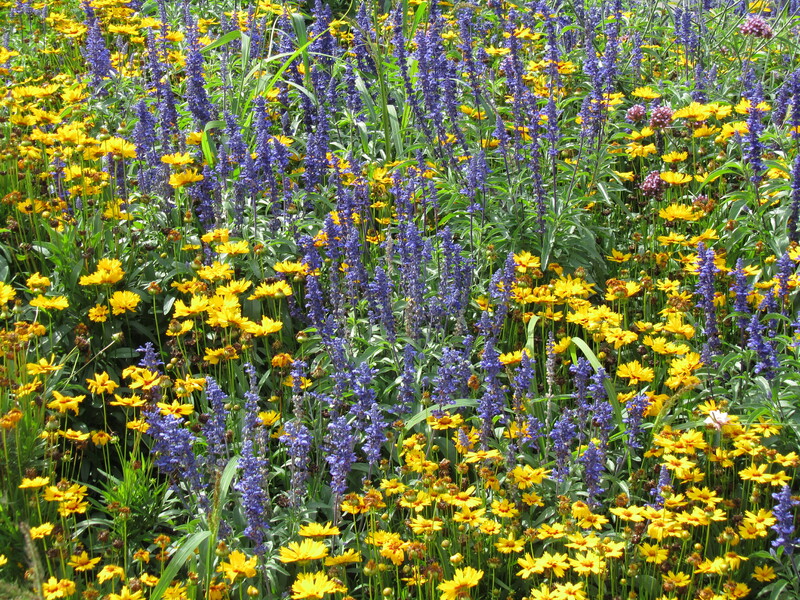 Now that the plants have grown and filled in, though, I think it is a most successful combination. I do want to commemorate my arrival 24 years ago almost to the hour, even though I’m not up to a long post. On August 1, 1988 my mother and I flew over from London on the last Austrian Air flight of the day into a hot and steamy Vienna, were awed by the spotless, shiny marble floors in the airport (now gone, apparently, lost to the latest expansion effort), and were delighted to be met completely unexpectedly by a school friend of hers. (In those days, before Vienna with the fall of the Iron Curtain once again became the hub of central Europe, the airport busses stopped running at 10 p.m. or so.) The school friend, who with her husband over the course of my first few years became my Viennese parents, hurried us out to the parking lot and drove with great elan into the city to get us to the student residence where we were staying before they locked the doors. I remember with incredible clarity the moment she pointed out the floodlit Staatsoper on the great Ringstrasse. Spectacular. I have just come back from a long walk in the Vienna Woods in summery temperatures followed by dinner with a few “G’spritze” (white wine spritzers) in Neuwaldegg with a friend so am off to bed. But what better way to celebrate?